I was honored to be invited to deliver the keynote remarks at the UW-Madison Bolz Center’s Arts Business Research Symposium March 13-14. I previewed those remarks here and have posted the full text serially over the last several days. 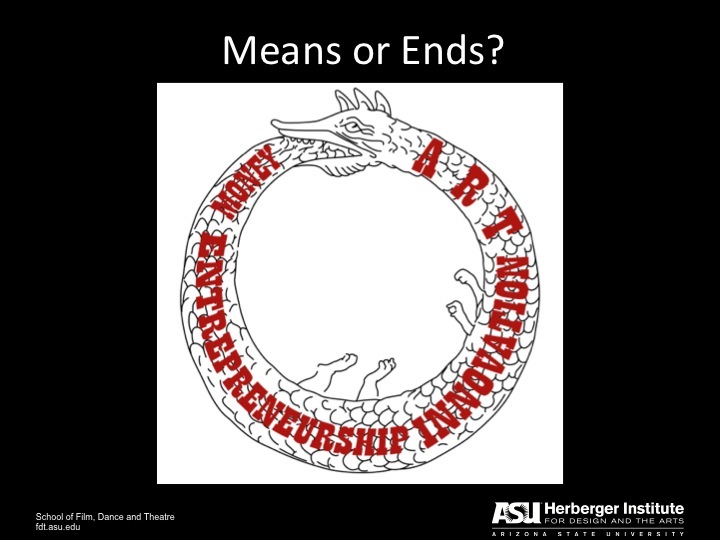 The talk was originally titled “Not about the Benjamins: Arts Entrepreneurship Research, Practice, and Education.” Here’s it’s just called “The Ouroboros.” This is part 7, the last. Before I wrap up, I want to take a little sidebar back to something I mentioned at the beginning – see: the Ouroboros metaphor is even manifest in the structure of this talk – the idea that good business practices support the arts. This is true at both the organizational and individual artist level. That is why, to support good business practices at the individual level, we at Pave are producing something we’re calling “The Arizona Arts Entrepreneur Toolkit.” Too often, artists don’t have access to the business planning tools they need, or if they do, they are scattered across the Internet and in multiple textbooks, rather than right there in front of them, thus creating a barrier to entry for artists. Some of the organizations I mentioned earlier, and I think specifically of Springboard for the Arts, provide similar services to their local or regional constituencies; thus our current project is new to Arizona, but, I freely admit, not new in concept. 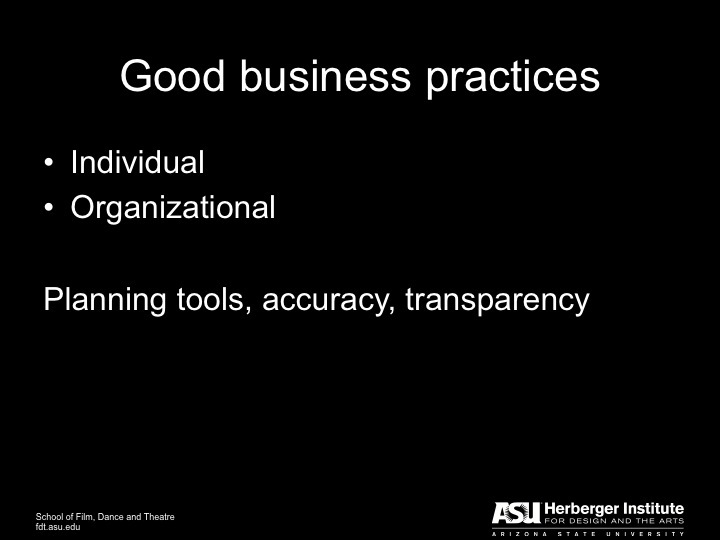 One of the things we all can continue to do, as these toolkits do and this symposium and the ones we hold biennially at ASU strive to do, is demystify business practices so that individual artists can use them and, yes, exploit them, in the creation of art. At the organizational level, the arts sector – especially the nonprofit arts sector — needs to be realistic, transparent, and accurate in its reporting. Arts organizations need to disclose to their boards – and the public – what it really costs to produce and present art. A few companies are starting to do that. However, I became incensed recently when American Theatre Magazine published an article titled “ZACH Theatre reveals all in its budget for August: Osage County.” The budget that was published was deceptively simple and deceptively low. In a letter to the editor, also posted as a comment online, I pointed out that the first step toward solvency for an individual theatre or for the sector as a whole is really understanding what it costs to make art happen. The article may have costed out most of what was visible in the photo that accompanied the article, but like the iceberg that sank the Titanic, the real costs are below the surface. Good, accurate, transparent accounting sounds boring and tedious, but it is a necessary business practice that supports the health of all of the arts. So, to return to arts venturing and our Ouroboros: is the creation of a business a means? Or an end? I remind you of the distinguishing feature of arts business and our Ouroboros. What distinguishes the arts business from tech businesses or manufacturing? When it comes to arts-based businesses, it’s not about the Benjamins, it’s about the art. With that provocation, I would like to open the session up for discussion. If, like the Ouroboros, you would like to return to the beginning, you can do so here or download the full text with citation. This entry was posted in Arts entrepreneurship, Arts funding, arts infrastructure, Arts management, Technology and arts and tagged Arizona Arts Entrepreneur Toolkit, arts entrepreneurship, Ouroboros, Pave program, Springboard for the Arts, Theatre. Bookmark the permalink.